Colorful Round Stone Necklace handmade with Swarovski Crystals from Kiss My Sass Jewelry. There are so many gorgeous Swarovski Crystal jewelry designs to feast your eyes on, I thought it would be fun to showcase a variety of the most loved, admired and pinned inspirations from our Pinterest page. Hopefully these gorgeous designs will infuse your creative spirit with a renewed zest for making uniquely beautiful jewelry! Purple Cluster and Dangle Earrings are handmade by Cameron’s Jewelry Box. These Swarovski Crystal Cluster Earrings are perfectly purplicious! Made with a variety of Swarovski Xilion Bicone Beads such as Purple Velvet, Amethyst and Tanzanite AB, these beauties feature the 5500 Pearshape Beads in Violet as the center drop. Swarovski Pearl tiered Necklace handmade by WowThatsBeautiful on Etsy. This elegant purple ombre pearl necklace features Mauve, Lavender and Cream Swarovski Pearls in an elegant tiered style. Delicate Purple and Silver Angel Earrings handmade by CraftDePeRaft on Etsy. These charming angel earrings have a sweet personality to them with her body being represented by a 5000-8mm Round Bead in Light Amethyst and a 6mm Lavender Pearl for her head. 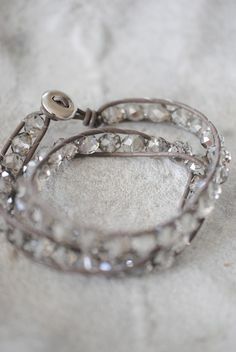 You could even add a little Crystal Rhinestone Rondelle at the top for a halo. Beautiful Swarovski Square Earrings with Gold Wire Wrapped Embellishment. These very unique and elegant earrings feature a beautifully designed gold wire wrapping around the Swarovski Square Bead. All that glitters is gold for these spectacular earrings! Delicately woven gold wire compliment the clusters of Swarovski 5000 Round Beads in a strikingly stylish and eye-catching design. These playful Swarovski Crystal 5601 Cube Earrings dance about adding a stylish and lively energy to their lucky owner and admirers alike. These 5 stranded gold chain and Swarovski Xilion Bicone Beads are dazzling, free flowing and a perfect accessory to compliment to an upscale event. This simple wrapped Swarovski Crystal bracelet emphasizes the elegance of the 5040 Rondelle Bead in Crystal Silver Shade beautifully. The versatility of this design could be worn as an everyday piece or for a fashionable evening out. Fashionably Refined Pearl and Crystal Wedding Bracelets featured on TheWedding Community Blog. Multiple strands of different sized pearl and crystal bracelets are a beautiful way to express your individual style. From delicate pearls and soft rays of Crystal Golden Shadow, to larger statement pieces, it’s a gorgeous way to display both a feminine and fashionable elegance. This entry was posted in Jewelry Inspirations and tagged 5000-8mm Round Bead in Light Amethyst, 5040 Rondelle Bead in Crystal Silver Shade, 5500 Pearshape Beads, 6mm Lavender Pearl, Amethyst, cheap crystals, Cheap Swarovski Crystals, cheap Swarovski Rhinestones, Cream Swarovski Pearls, Crystal Purple Cluster and Dangle Earrings, Crystal Rhinestone Rondelle, Crystal Wrap Bracelet, discounted Swarovski beads, discounted Swarovski Pendants, Gold and Bicone Beaded Dangle Earrings, Gold and Crystal Golden Shadow Swarovski Beaded Earrings, handmade Necklace, Mauve, purple ombre pearl necklace, Purple Velvet, Rainbows of Light, Swarovski, Swarovski 5000 Round Beads, Swarovski Crystal 5601 Cube, Swarovski Crystal Beads Wholesale, Swarovski Crystal Beads Wholesale to the public, Swarovski Crystal Cube Dangle Earrings, swarovski Crystal jewelry designs, Swarovski Crystals, SWAROVSKI ELEMENTS, Swarovski Lavender Pearls, swarovski pearls, Swarovski Round Stones, Swarovski Square Bead, Swarovski Square Earrings with Gold Wire Wrapped Embellishment, Swarovski Wholesale Beads, Swarovski Xilion Bicone Beads, Tanzanite AB, Top 10 Most Loved Swarovski Jewelry Designs on Pinterest, wedding jewelry, wholesale crystal beads, Wholesale Swarovski Crystal Elements. Bookmark the permalink.